The 1-Day ACUVUE contact lenses from Johnson & Johnson treat your eyes every day. This has two main advantages: First, you don't need to worry about cleaning and storing the lenses. Secondly, as you take new contact lenses out of the sterilised packaging every time you want to wear them, daily lenses are perfect for people with allergies as well as for those who only wear contact lenses occasionally, for example when playing sport. As with other products in the popular ACUVUE family, 1-Day ACUVUE contact lenses feature the 1-2-3 labelling system to prevent you from putting the lenses in incorrectly. In addition, 1-Day ACUVUE contact lenses are tinted with a subtle blue colour. 1-Day ACUVUE contact lenses offer significantly higher levels of comfort than other daily lenses. They will care for your eyes as well as optimising your vision. In addition, the integrated UVA and UVB protection will keep your eyes healthy and reduce the risk of infections. 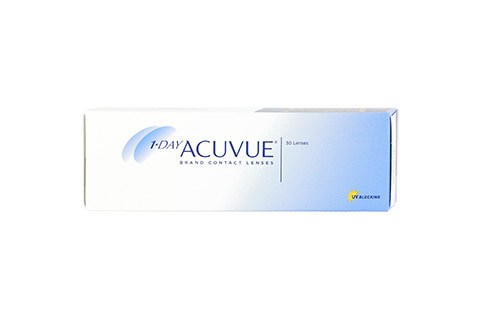 Mister Spex advises all online purchasers of 1-Day ACUVUE contact lenses: the contact lenses, 1-Day ACUVUE, should always be fitted to your eyes by an eye doctor or optician. The period between fittings, unless otherwise prescribed by an eye doctor or optician, should not exceed 6 months. You should go for regular check-ups. The recommended wearing time from the manufacturer Johnson & Johnson/your eye doctor/optician for 1-Day ACUVUE contact lenses should be followed strictly. It is your own personal responsibility to make yourself aware of the care instructions for 1-Day ACUVUE contact lenses and to follow them accordingly. In case of eye irritation or visual impairments caused by 1-Day ACUVUE, remove the contact lenses immediately and consult an eye doctor or optician. Damaged contact lenses should be replaced immediately.